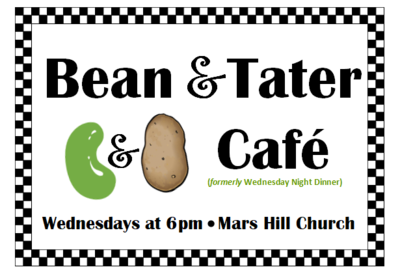 Our dinners provide a great opportunity to spend time with our church family through the week and to meet new people. It is a welcoming, casual environment. We eat together in the Fellowship Hall, which is toward the rear of the campus. Sign up for dinners by noon the Monday preceding the dinner. If you have questions, please contact Michelle Marshall at michymoshl@aol.com. To sign up online, please fill out the form below, click submit, then either pay online or at the door. Our new schedule will go through May 15th (taking April 3rd off for Spring Break) stay tuned for the full schedule. Join us in the chapel after dinner for our "Gospel of John" Bible Study! March 13 - FREE Italian Dinner! Contact Michelle Marshall at michymoshl@aol.com for more information and to sign up. March 20 - Lasagna, salad, rolls and dessert. March 27 - Chicken pot pie, coleslaw, rolls and dessert.